Dr. Jugal Kishore is recognized, not only in India but the world over, as one of the top most Homoeopath of our times, with over 60 years of experience. About 32 years ago his son Dr. Arvind Kishore - a qualified Allopath, joined his father after completing his post graduation in Homoeopathy from the faculty of Homoeopathy of the Royal London Homoeopathic College. Both father and son with a dedicated team of associate consultants have successfully treated tens of thousands of patients till date. 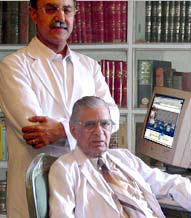 Dr. Jugal Kishore passed away peacefully on 23rd January 2012 living a full and satisfying life. Even in death gave us something to be proud of having being conferred with an honour of Padamshree for his service to Homoeopathy and humanity. We celebrate his life which was dedicated to promoting the cause of Homoeopathy & alleviating the suffering of thousands of people. We are sure he will continue to motivate us in continuing his noble work.